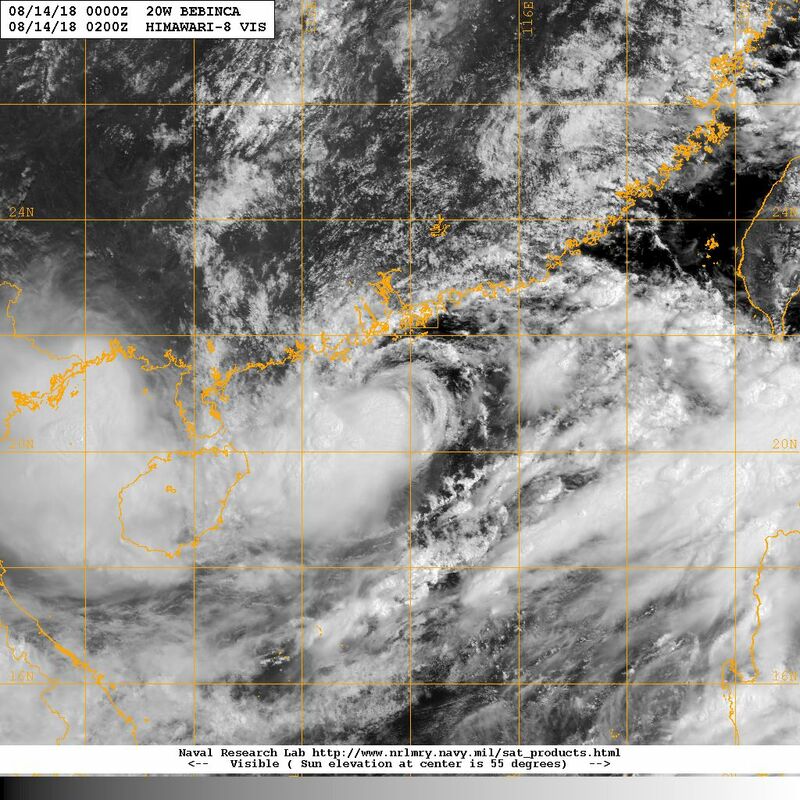 BEBINCA developed within the South China Sea as a broad area of low pressure on August 8. The Joint Typhoon Warning Centre (JTWC) issued a tropical cyclone formation alert on the system (96W) that night. 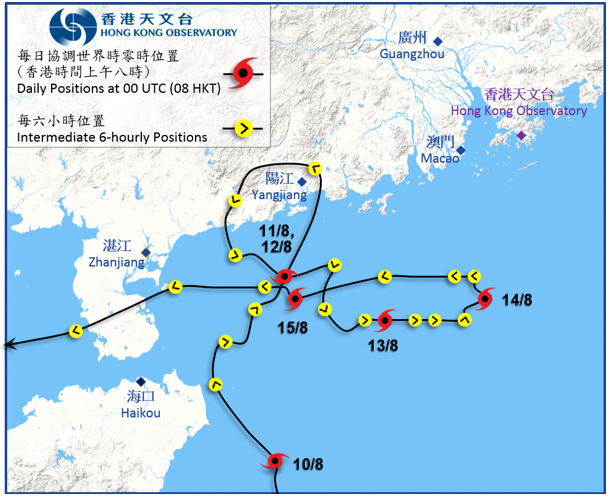 96W was initially expected to move north gradually towards western Guangdong due to a weak steering ridge that persisted in the eastern part of the South China Sea. However, numerical models were also suggesting the possibility of a brief eastward motion as the equatorial ridge was expected to strengthen. 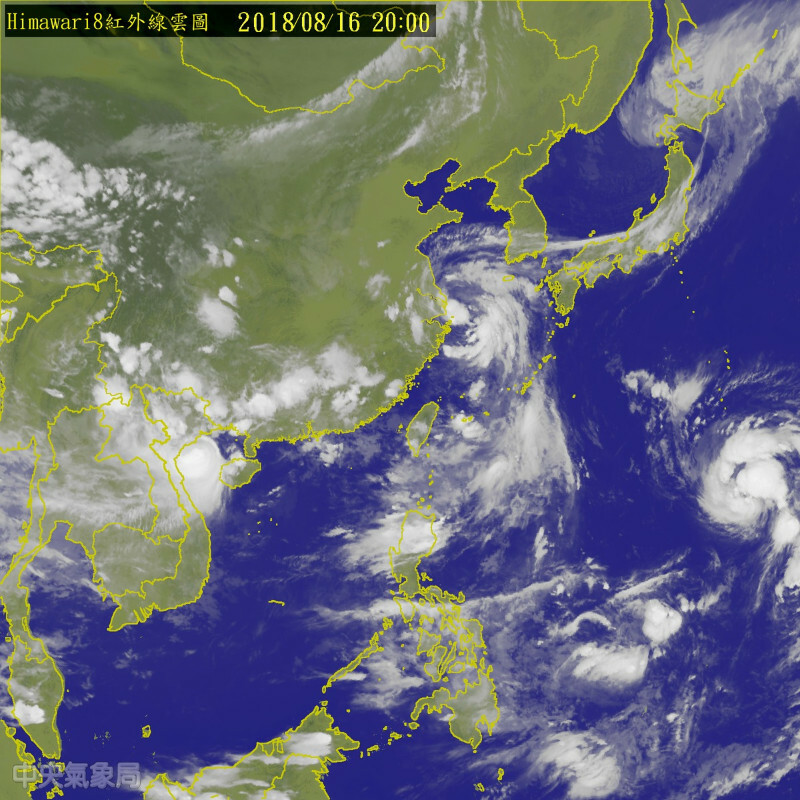 The National Meteorological Center (NMC) of China upgraded 96W into a tropical depression at 8 am on August 9, with an initial forecast of persistent movement towards the north-northwest. 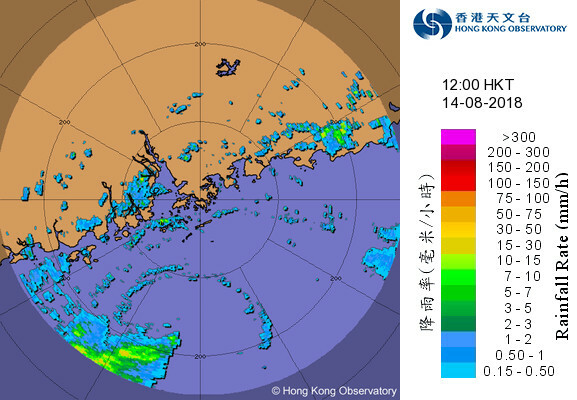 The HK Observatory (HKO) also upgraded the system that afternoon. 96W moved north to north-northwest without much development over the next two days, making landfall near Yangjiang, Guangdong at around 11 am on August 11. Instead of moving inland, 96W moved southwest back into the South China Sea later that night, and turned east in response to a strengthening equatorial ridge. During 96W's eastward motion, the storm gradually picked up strength with convections tightening mostly in its western semicircle. The JTWC upgraded it into tropical depression 20W during the night of August 12, predicting the storm to move east in the next day before looping back to the west. 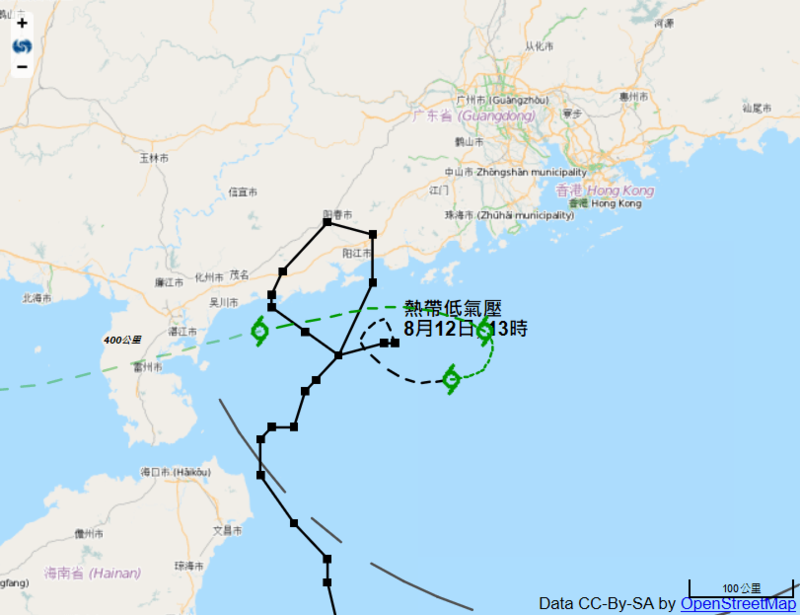 This was in line with model predictions with various models differing on the extent of the eastward track, due in part to the equatorial ridge and in part to the nearby tropical storm YAGI that was approaching Zhejiang at that time. The Japan Meteorological Agency upgraded 20W into a tropical storm in the morning of August 13 and named it BEBINCA. BEBINCA's core developed gradually during the day and continued to move east. It decelerated again in the morning of August 14, moved north just west of 114°E and turned back to the west that afternoon. 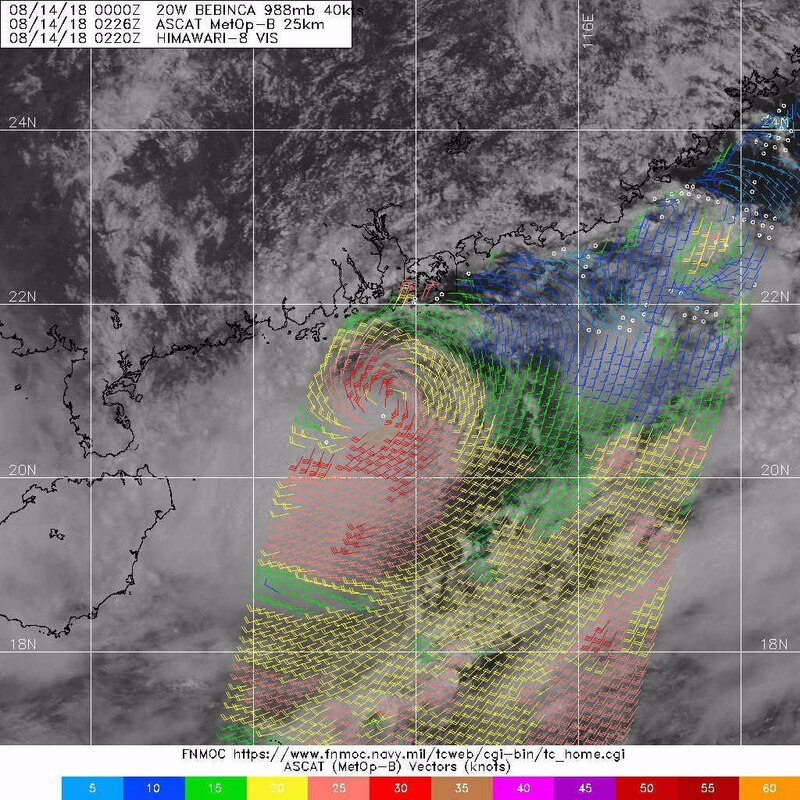 BEBINCA's convections then expanded in size, prompting both the NMC and HKO to upgrade it into a severe tropical storm. 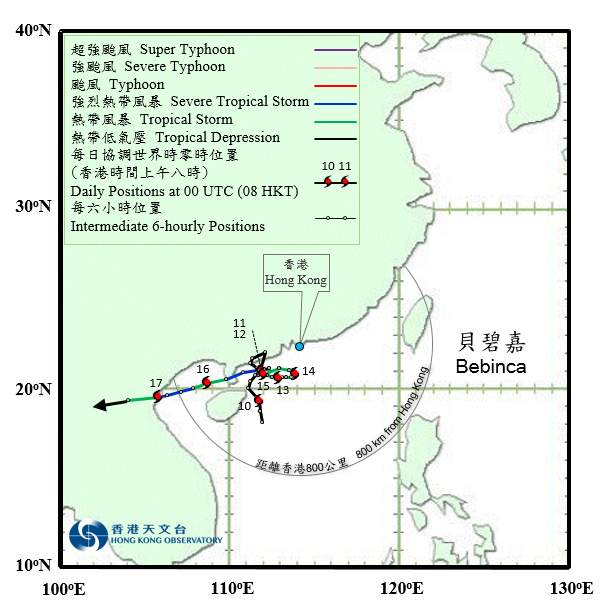 BEBINCA maintained a generally westward motion on August 15 and made landfall at Leizhou Peninsula that night. It briefly weakened into a tropical storm before benefiting from the high ocean heat content in the Gulf of Tonkin on August 16. As BEBINCA moved west-southwest, it crossed the middle of the Gulf and strengthened again into a severe tropical storm. The storm accelerated and made a final landfall in northern Vietnam in the small hours of August 17. It continued to move west inland and weakened gradually into an area of low pressure that night. The HKO issued the #1 Standby Signal at 5:15 pm on August 9, the time of its upgrade of 96W into a tropical depression. 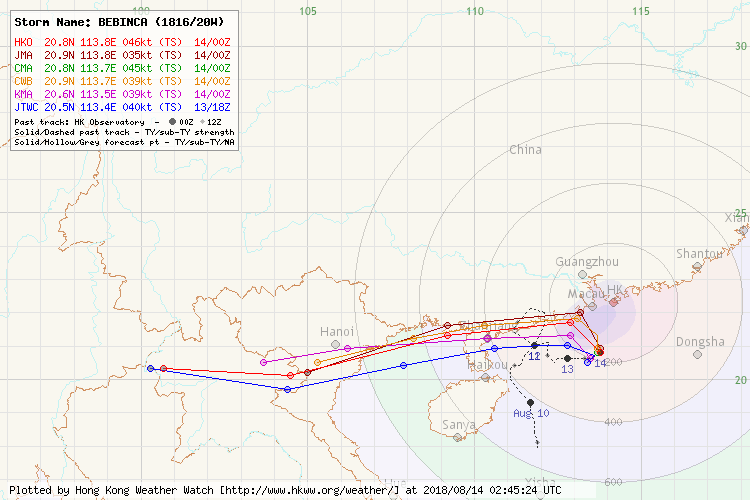 During the next few days, 96W maintained a considerable distance from Hong Kong. 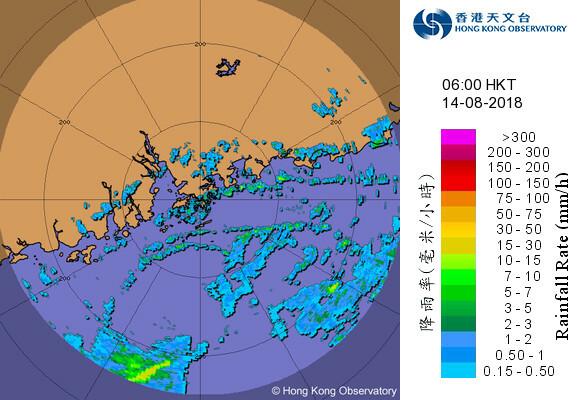 Nevertheless, Hong Kong was affected by BEBINCA's outer rainbands and most of the territory received more than 40 mm of rainfall on each of August 10, 11 and 12. The Amber Rainstorm Warning was issued three days in a row. BEBINCA gradually lost the characteristics of a monsoon depression during its eastward motion; its convections shrank in size and winds became more concentrated near its centre. 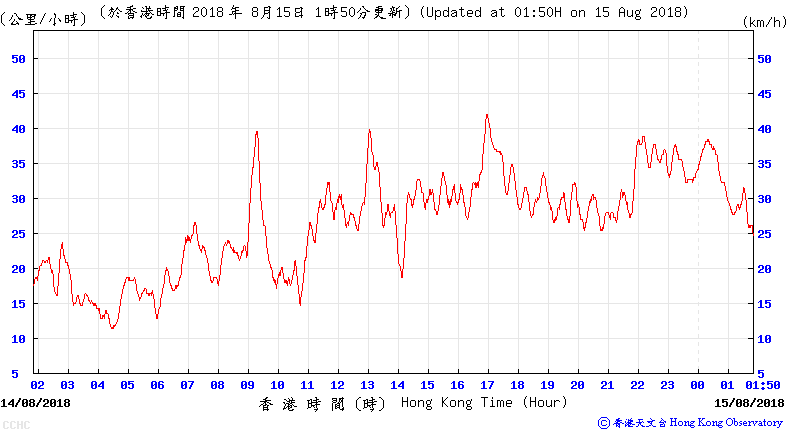 The HKO mentioned several times between August 11 and August 13 that the #3 Signal may be considered, but the signal change was delayed because of the weak observed winds in Hong Kong. 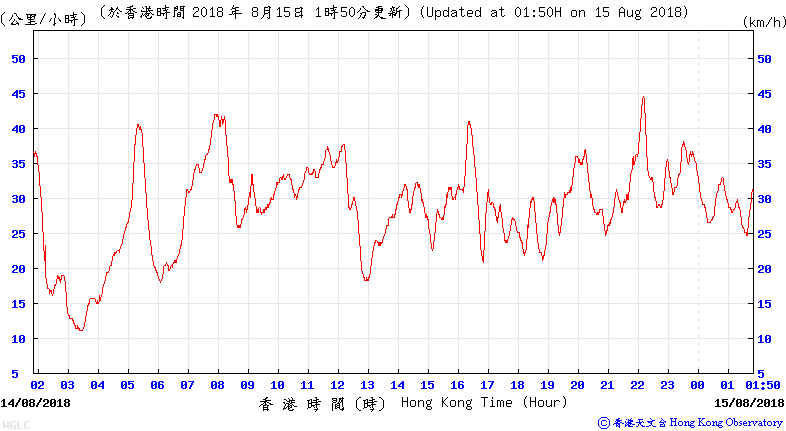 The #3 Strong Wind Signal was eventually issued at 5:20 am on August 14, when BEBINCA started to turn north and was around 190 km south of Hong Kong. The signal replacement took place 108 hours and 5 minutes after the issuance of the #1 Signal, making it the second longest on record (after Typhoon DINAH in 1977). Winds turned east and strengthened somewhat during the morning, but they were way below strong force at many places (even weaker than several days ago, when the #1 Signal was in force) although BEBINCA was less than 200 km from the territory. 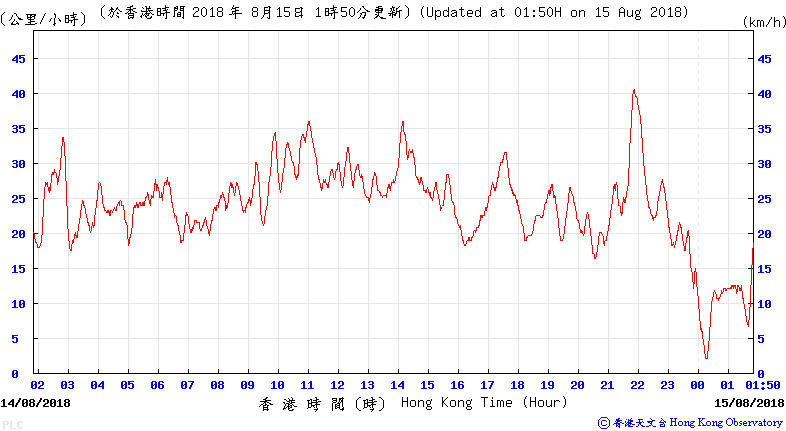 Cheung Chau was the only reference station (out of 8) that registered strong force winds during the period when the #3 Signal was in force; all other stations that recorded strong winds, e.g., Tap Mun, Tate's Cairn and Waglan Island, were either at offshore areas or on high ground. 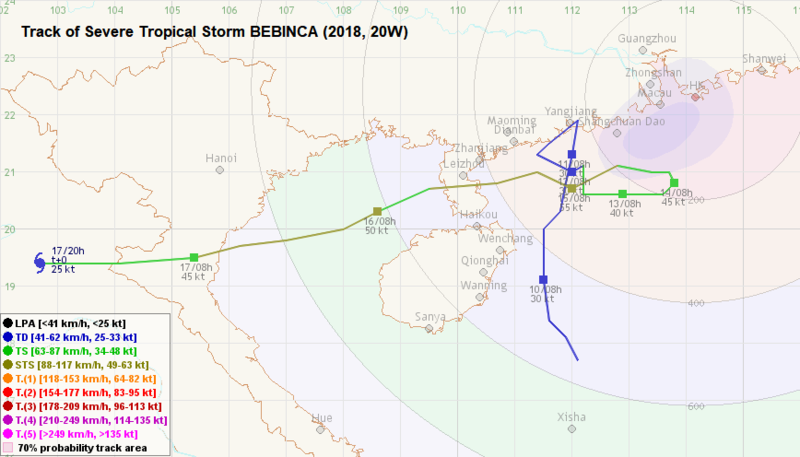 The HKO initially mentioned that BEBINCA would approach the vicinity of the Pearl River Estuary in its tropical cyclone report. This however did not materialize as the storm turned west after a period of stagnation in the morning of August 14. 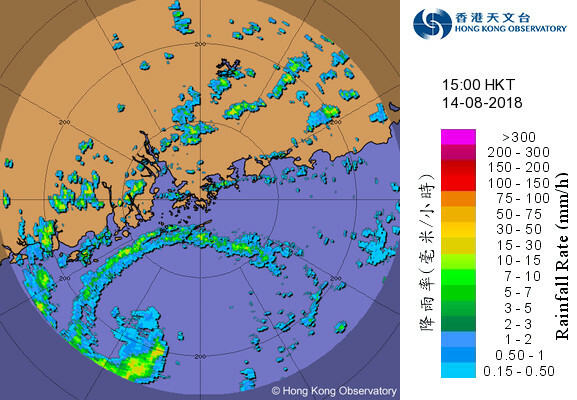 At around 150 km south-southwest of Hong Kong, BEBINCA was the closest to the territory in the early afternoon. Locally, there were a few squally showers in the afternoon of August 14, and winds moderated in the small hours of August 15. The Observatory replaced the #3 Signal by the #1 Standby Signal at 2:20 am when BEBINCA was 190 km southwest of the territory. This signal was cancelled just three hours later. 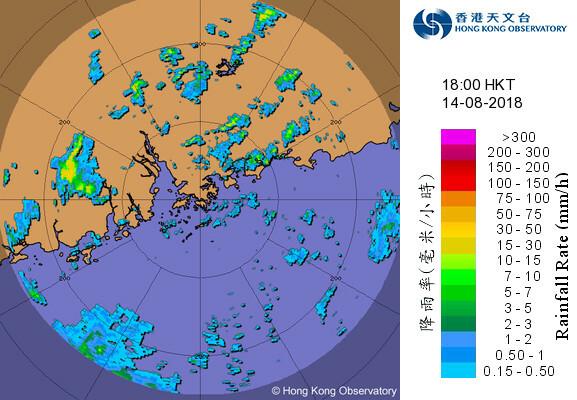 The weather in Hong Kong remained unstable during the next few days as convective activities associated with a trough persisted in southern China. It is interesting to note that the #8 Gale or Storm Signal was issued in Macau for 5 hours during BEBINCA's approach. However, BEBINCA's small wind radii meant that winds were much weaker than expected there as well. Figure 1 - Steering flow map on August 12. Tropical Storm YAGI was approaching Zhejiang at that time.